Do you possess the courage to open Pandora's Box and discover the bountiful swag included in the God of War III Ultimate Edition? An epic game needs a truly epic collector's edition, and Sony is delivering just that. The God of War III Ultimate Edition is a work of art. Specifically a work of sculpture, as the whole thing comes packed inside a high-end sculpted replica of Pandora's Box. To those of you behind on your Greek mythology, Pandora's Box is the container in which was stored all of the evils of man - hatred, jealous, internet flame wars, MySpace, etc. 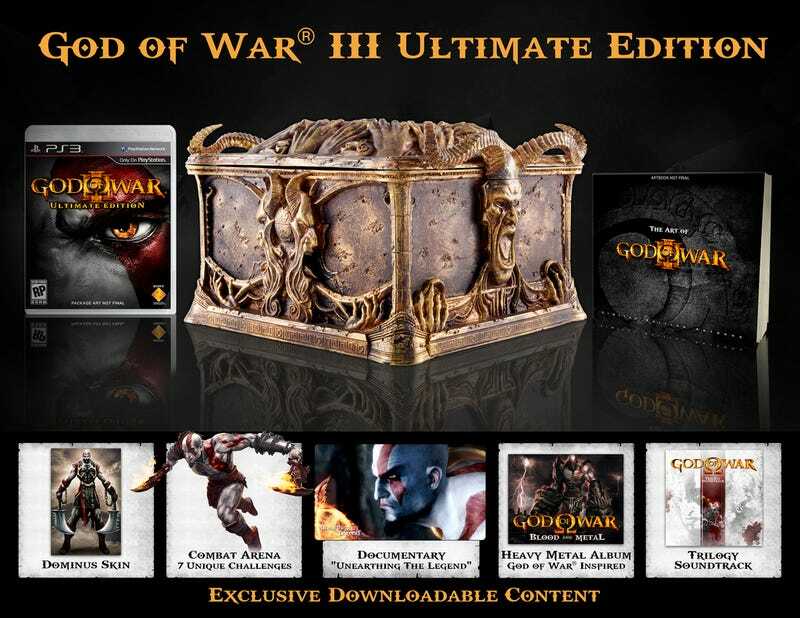 It was actually a jar, but the case for God of War III wouldn't have fit inside a jar, and neither would the limited-edition God of War art book, featuring interviews, art, and additional content to please fans of the series. Along with the box, game, and book comes a slew of exclusive digital content available on day one of the game's launch. There's a God of War combat arena with seven challenges to overcome; a premium Dominus Kratos skin; a full-length movie documentary called God of War: Unearthing the Legend; the God of War trilogy soundtrack; and the God of War: Blood and Metal EP, which is a heavy metal homage to the series. Now how much would you pay? But wait, there's more! Preordering the game at Amazon, GameCrazy, or GameStop will net you a code to download the E3 2009 God of War III demo as soon as today, along with one of three exclusive Kratos skins, seen below. I believe the first is Amazon, followed by GameCrazy and then GameStop. No word as to how much that massive sculpted box full of stuff will cost you, but is money really an object when it comes to large, wholly unnecessary stone boxes? UPDATE: GameStop is saying $100.